Tiny rock houses built into the cliffs above the town provided some relief from blazing hot temperatures. Primary Minerals: Silver and Borax. The Total Wreck (Burcham) Mine was mined for gold from 1930-1941. Although most of these mines have stood dormant for a century or more, there is a strong possibility that the enormous quantities of low grade silver ore present at Calico will one day be mined again. Years of Operation: In 1881 California's largest silver strike was discovered here. Calico's population boomed, but by the mid 1890's silver had lost its value and the population began to decline. Borate production kept the town alive, even through the panic of 1906. In 1917 cyanide was used to recover silver from the Silver King mine dumps. During the early 1930s a small operation called the Zenda Gold Mining Company mined here for silver. Gold was mined from the Total Wreck (Burcham) Mine from the 1930s until 1941. Using old photos from the town he once mined in, Walter Knott authentically rebuilt many of these structures. Calico is such an interesting ghost town with such a rich history that I’ve decided to devote two pages to it, Calico Ghost Town and Calico Mines. It’s not in Los Angeles County, but occasionally I wander to nearby counties to visit spectacular sites such as this. 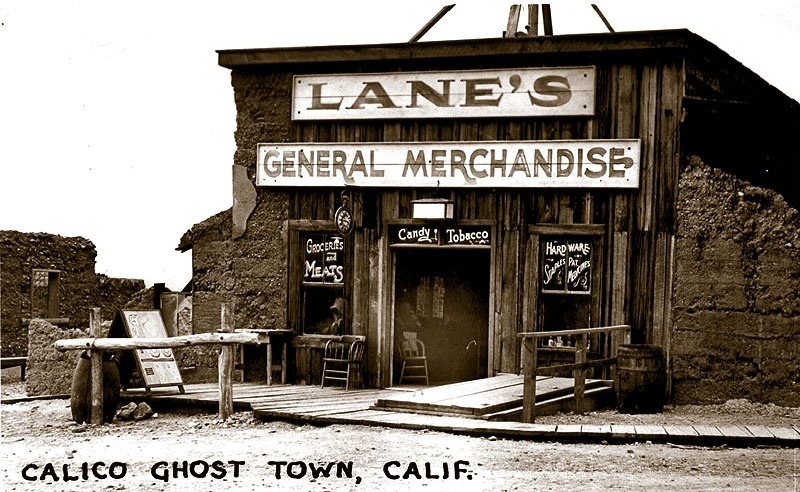 In 2005 the State Senate and State Assembly listed Calico as the Official State Silver Rush Ghost Town, while Bodie became the Official State Gold Rush Ghost Town. Calico is not your average theme park. In fact there’s a line of small print in the brochure they hand you which states that in exchange for them allowing you the "privilege" of entering their property, you won’t hold them responsible if you get killed. In other words, there are open mines all over the place. This is no Knott’s Berry Farm. They kept the town as authentic as possible, and that's the way I like it. There are over 500 mines in and around Calico. Most were silver mines, but borax was also mined here. In 1881 four prospectors were leaving Grapevine Station (now known as Barstow, California) for a mountain peak to the northeast. The four prospectors discovered a large silver deposit on the side of a “calico-colored” mountain, which would become known as the Silver King Mine (King Mine), named after John C. King, the Sheriff of San Bernardino County, who grubstaked “financed” the claim., The Silver King would become California’s largest silver producer in the late 1880s. John King was the uncle of Walter Knott, who worked the mine in his younger days and later became the founder of Knott’s Berry Farm in Buena Park. Calico families enjoying a picnic. These were probably merchants, as most of the miners were single men. A post office was established in early 1882, and the Calico Print, a weekly newspaper, started publishing. The town soon supported three hotels, five general stores, a meat market, 22 saloons, brothels, three restaurants and boarding houses. By 1885, Calico began to look almost civilized. It had a school house and a voting precinct, along with a literary society and even a dancing school. A deputy and two constables were employed, as well as two lawyers and a justice of the peace. There were also five commissioners and two doctors. The school house doubled as a church on Sundays and a Sunday school class on weeknights. A Wells Fargo office, telephone and telegraph service were soon added. The news of pure silver the size of fists spread like wildfire throughout the mining world and the stampede was on. One observer reported, “Everybody in town was carrying a specimen in their pockets.” Calico boomed from an initial population of 40 in 1881 to 1,200 by 1887. Chinese laborers lived in their own small Chinatown area, and miners from England, Ireland, Greece, France and the Netherlands flooded the town. At the height of the silver production between 1883-1885 there were 500 mines in and around Calico. The town burnt to the ground in 1883, but was quickly rebuilt. Borate was also discovered, swelling the town’s population once again. 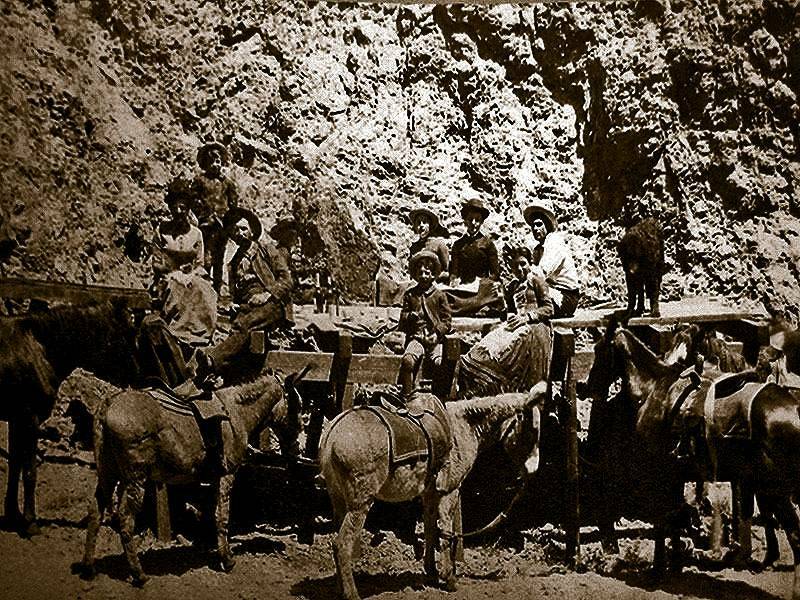 Some sources claim that as many as 3,500 lived in Calico. After Calico was abandoned, several of the original structures were moved to Barstow, Daggett and Yermo. But there was trouble on the horizon. In 1890 the Sherman Silver Purchase Act was established, which drove down the price of silver. Between 1890 and 1894 silver prices plummeted from $1.31 an ounce to $.63 and Calico’s silver mines were no longer economically viable. By 1895, U.S. mints halted production of silver coins and banks were discouraged from using silver dollars. In fact, because of the low production of Morgan dollars dated between 1893 and 1895, it became a very rare coin. During its boom period Calico produced $86 million dollars in silver ore and $45 million in borate minerals. But by the mid 1890’s the town began to decline. By 1898 the post office was discontinued. The school closed soon after. By the turn of the century Calico’s population had dropped to less than 300. 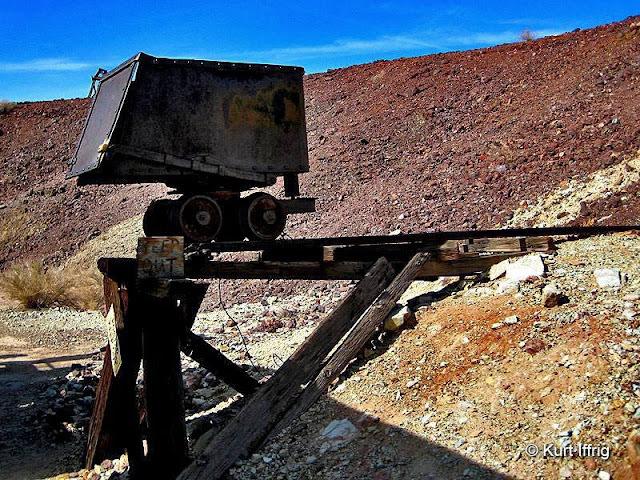 Borax mining went belly up by 1907, when the town was almost completely abandoned. Many of the original buildings were moved to Barstow, Daggett and Yermo. Also several structures were moved to Knott's Berry Farm in Buena Park, which was an actual berry farm at the time. Those structures were used to create the original ghost town attraction. 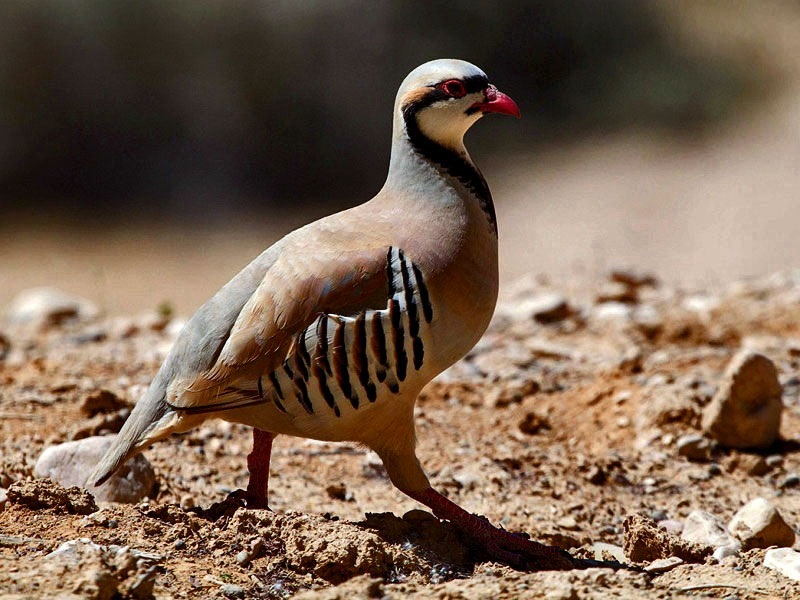 Chukars are partridges that were originally imported from India. They thrive in the desert all around Calico. One final attempt was made in 1915 to revive the town, when a cyanide plant was built to recover silver from the unprocessed Sliver King Mine’s deposits. Around this time Walter Knott and his wife Cordelia, founders of Knott’s Berry Farm, were homesteaded at nearby Newberry Springs. Knott helped to build the redwood cyanide tanks for the plant. In 1951, Knott purchased the town and began restoring it to its original condition referencing old photographs. He installed a longtime employee named “Calico Fred” Noller as resident caretaker and official greeter. In 1966, Knott donated the town to San Bernardino County, and Calico became a County Regional Park. Today Calico has a population of eight people, who live in villas built just above the ghost town. A nearly exact replica of the old Calico school house. This structure is two thirds of the original size. 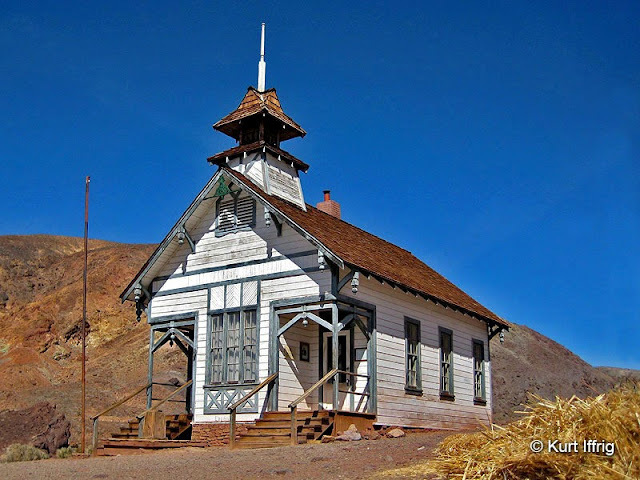 Calico’s original school house was built in 1885. The building you see above is a replica, built in the 1950’s. Old photos were used to match the architecture as closely as possible, however the building you see today is one third smaller than the original structure. Calico’s first school was run out of a boarding house until the new school was built. Calico’s School District ran from 1882 until 1899, when the population dwindled. As many as 30 students would be enrolled for a class term, but the average daily attendance was about half that amount. Teachers made a fairly good living in this town. Monthly salaries ranged from $70 to $110 per month, while miners made about three dollars a day. Most of the children who attended the school were sons and daughters of merchants in the town, since most miners did not have families. Some time ago two British tourists visited Calico and talked at length with a staff person dressed in period costume, who explained to them she was the “last teacher” in Calico. When they were ready to leave, the self-proclaimed teacher allowed them to have photos taken with her. Upon arriving home, the pictures were developed and the tourists were amazed to find that the “staff member” did not appear in any of the photos. They later discovered that no staff member had been working at the school house during their visit. 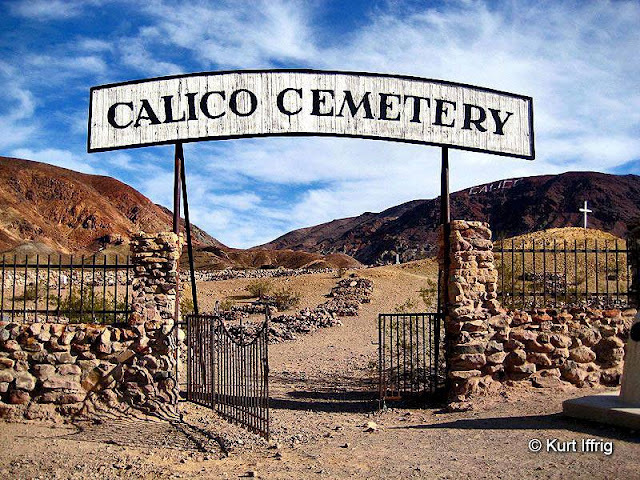 Calico’s last school teacher, Mrs. Margaret Kincaid Oliver is buried in the Calico Cemetery. This wall was built after several headstones were stolen from graves. Between 117 and 130 bodies rest here. 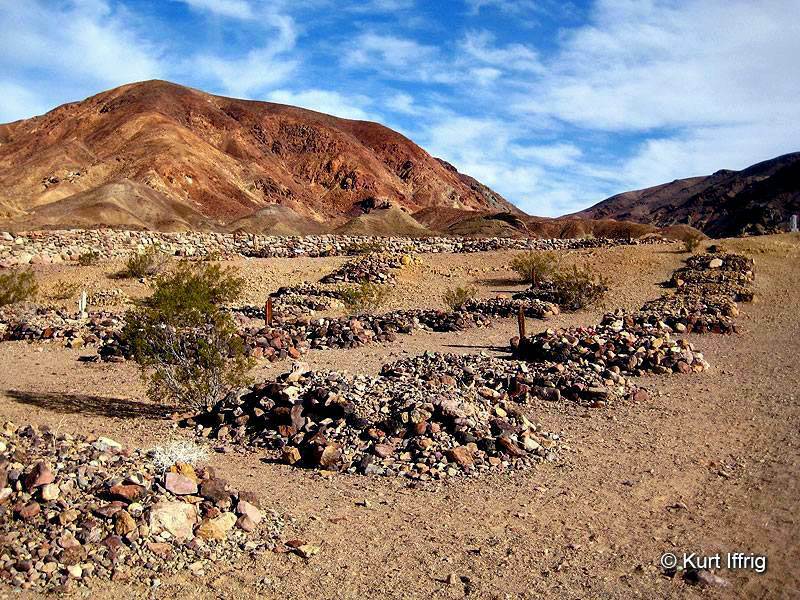 Less than 1/4 mile from Calico’s main street is the historic Calico Cemetery. It rests on a small hill overlooking the town, known as Boot Hill, a common name given to graveyards of the Old West. Today a stone wall and iron fence surrounds the graves, but this was not always the case. During the decades that the town was left for dead, wooden fences and markers were stolen by vandals, headstones were removed and some of the graves were dug up. For that reason, the exact number of bodies that rest here is unknown. Various resources place the number between 117 and 130. One source claims there are as many as 160. With a few exceptions it’s difficult to determine exactly who is buried here. Most of the original grave markers were made of wood with shallow inscriptions that were worn off over the years, but about a dozen head stones are still readable or more recent. Among them are Tumbleweed Harris (1906-1979), marshal of Calico for seven years; Samuel Lyons King (1826-1882, one of the prospectors who helped to found the Silver King Mine: which resulted in the birth of Calico, Margaret Kincaid Olivier (1849-1933), Calico school teacher in 1898 and 1899; and "Death Valley Helen" who was really Helen Wallace (1921-1982). This is roughly the way the original graveyard looked. However most of the wooden markers are gone. In the 1960’s, rangers were tasked with finding out who was buried in the cemetery. The graves were in desperate need of repair and protection. It was discovered that there were actual grave markers of people who had never even visited Calico, like Wyatt Earp and other Old West celebrities. During a brief period in the 1950’s various markers of western celebrities had been added to enhance the experience of tourists, but this only added to the difficulty of restoring the cemetery. In the 1970’s old photographs, coroner’s reports, death certificates, affidavits and burial permits were examined to determine who was buried here. Only 117 of the graves could be properly identified, leaving 20% undetermined. By the 1980’s infrared aerial photographs were taken, which reportedly turned up 160 bodies.Testimony from old timers could only identify 49 of the 160 bodies, so to this day the identities of many souls buried here remains a mystery. A reconstruction of the Cosmopolitan Hotel, one of at least six hotels and boarding houses in old Calico.. The Sweets Shoppe is a reconstruction of the old Cosmopolitan Hotel, which was one of several two story buildings located in the town during the silver boom of the 1880’s-1890’s. 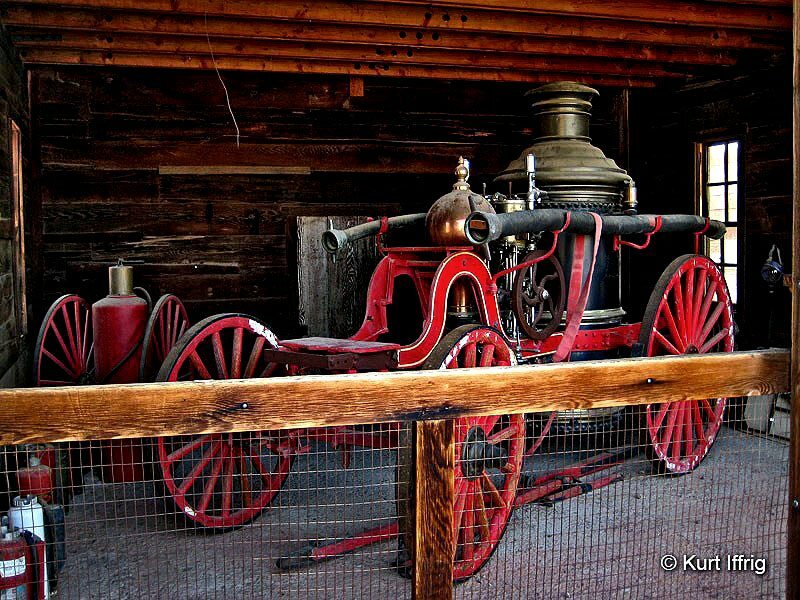 This reconstruction was built in the 1950’s, but was destroyed by a small fire in 2001. Prior to its rebuilding it was known as the Spice Shop. At one time the Sheriff of San Bernardino, John C. King, owned a half interest in the original Cosmopolitan Hotel. John King was also the owner of the Silver King Mine, the richest mine in all of Calico. Sheriff King was also the uncle of Walter Knott, who would eventually rebuild the ghost town. You might know Walter as the founder of Knott’s Berry Farm, in Buena Park. He worked as a miner in Calico during his younger days and used old photos of the town to make it as authentic as possible when it was rebuilt in the 1950’s. 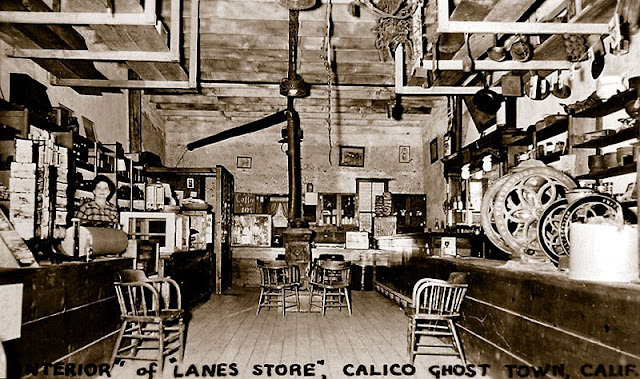 Other hotels and lodging houses in old Calico included the Whifield House, the Occidental House, Jordan’s Hotel, the Calico Hotel, Applewhite Boarding House and the Calico Lodging House. Miners without families would commonly live in boarding houses operated by mining company employers. Some chose to live in wood and rock cabins they built into the hillside above the town. This reconstructed hotel is now a candy shop, and although there was not a candy store in the original town, folks were able to order candy tins from mail order companies in the 1890’s. Long time Calico resident and store owner Mrs. Lucy Lane recalled that miners would chip in each Christmas to buy bags of candy for all the children in the town. Candy was also stocked at Calico’s drug store. The bottle house was built with 5000 old bottles. 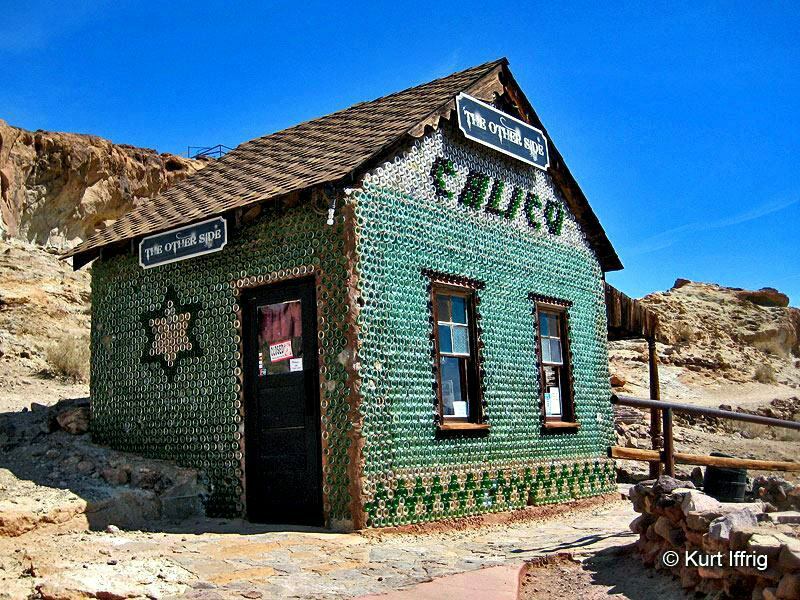 It was inspired by the Rhyolite Bottle House in Nevada. The Bottle House was not an original structure in old Calico. 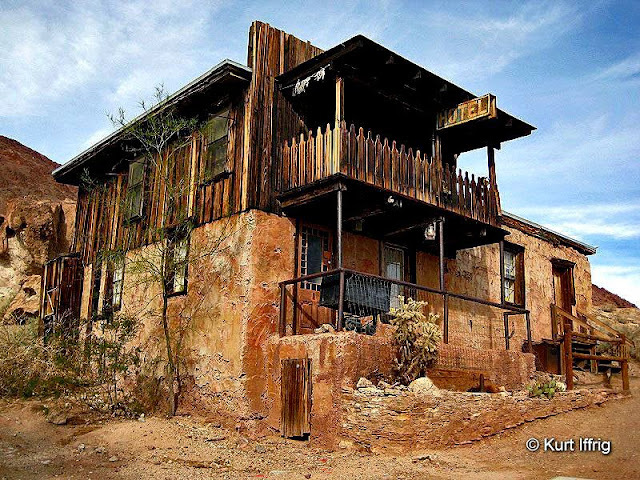 It was built in 1951 when Walter Knott began restoring the Calico Ghost Town as a tourist attraction. In 1966, Knott donated the town to San Bernardino County. The Bottle House was empty until 2013 when it was put to use as The Dog House, which sells dog treats. The house pictured above is made out of 5000 bottles. There's a smaller version at Knott’s Berry Farm which used 3000 bottles in its construction. Both were inspired by a trip Walter Knott took to a gold mining ghost town in Rhyolite, Nevada. 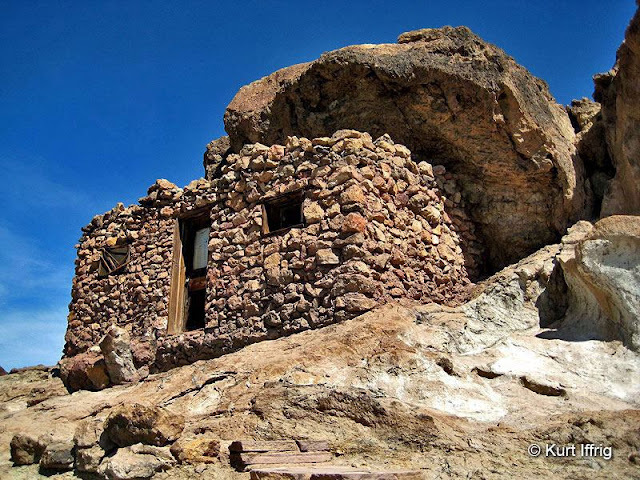 Around 1905, Tom Kelly built his famous house in Rhyolite, Nevada. It was built with 51.000 beer bottles and adobe mud. Even the walkway was built from bottles. Kelly chose these materials because there was virtually no wood in the desert. In his words, “It’s very difficult to build a house out of a Joshua Tree.” It took a year and a half to build the three room, L shaped house. Gingerbread trim was also added. The total cost was $2,500, mostly spent on wood and fixtures inside. Most of the bottles were donated from the 50 bars that once existed in Rhyolite. Rhyolite was once the center of Nevada’s gold mining district. It went from boomtown to bust in just six years. In 1906, there were 10,000 residents, but by 1920, there were only 14. In 1925, Paramount Pictures discovered the Bottle House and had it restored and re-roofed for a movie. It then operated as a museum for awhile but tourists were scarce. From 1936-1954, Lewis Murphey took care of the house and invited tourists to visit. He was the last inhabitant. He tried to make repairs to the deteriorating house with concrete. However, because the concrete absorbed the desert heat, many of the bottles cracked. Earthquakes and weather only made things worse. Then in 2005, it was repaired and a new roof was installed. The house is now one of the few buildings still standing in the town. A vintage postcard of Lane's General Store. Lucy Bell Lane remained in Calico, long after it was abandoned. Lucy Bell Lane died in January of 1967 and was buried next to her husband in San Jacinto. She was arguably the First Lady of Calico and called it her home off and on for more than 60 years. She was 10 years old in 1884 when her family arrived there in the middle of its boom period. She later saw it bust, like all mining towns do. But while most people moved on to other boomtowns after the bad times arrived, she was always attracted to the place named for its colorful hillsides above her home. The daughter of a hard-rock miner, Lucy Bell would go on to marry John Robert Lane, the water superintendent of Calico. On her wedding day she recalled walking down Main Street through six inches of dust in her wedding gown and white shoes. After the 1890’s the silver rush was more or less over, but John and Lucy stayed on, at least for awhile. She operated a store for the few miners and families who remained and continued to search for riches underground. When they could no longer pay what they owed at the store, they turned over mining claims to the Lanes and walked away. Lane's Store, taken in the 1940's. When miners ran out of money they handed over mine claims to settle up. .
Lucy and John lived briefly in other mining camps and for awhile they managed the Glenn Ranch in Lytle Creek Canyon. In 1916, John Lane found an outcropping of quicksilver – mercury – which he processed with Lucy’s help. It wasn’t the mother lode, but the money they made from the quicksilver gave them enough to fix up their home and store in Calico and move back into the rather empty town. 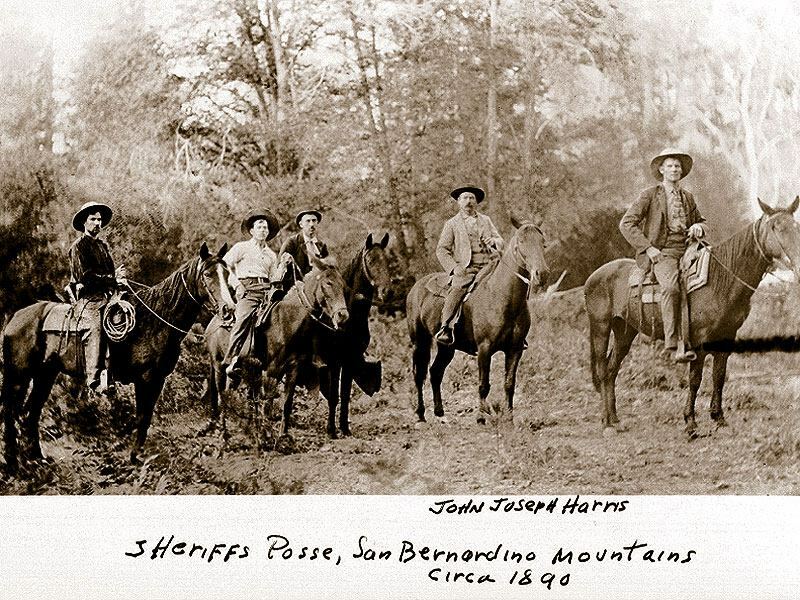 In 1934 while searching for silver, John Fell ill and died in Hemet. Lucy stayed on in Calico for many years, but would stay with her children during the harsh winter months. 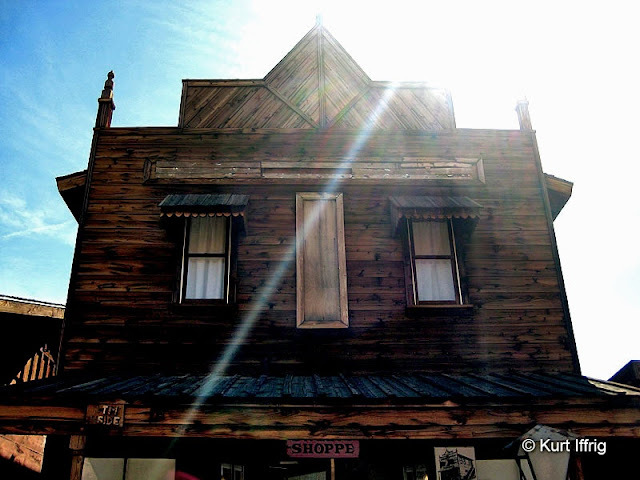 In honor of Lucy Lane, Walter Knott restored the original store and home she lived in. 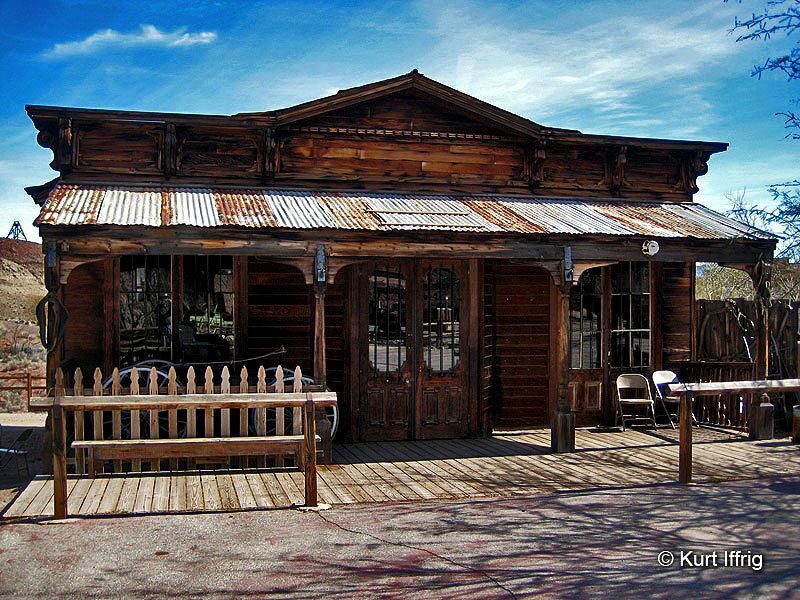 Lucy Lane’s House and Lane’s General Store are two of only five remaining original structures still located in Calico. The others are Lil’s Saloon, the Zenda Mining Company and the Calico Park Office. With saloons, gambling and lots of silver, crime was bound to happen. But Calico did have lawmen. Some of the confirmed bodies in Calico’s Cemetery attest to the fact that Calico, like most mining towns was not without its problems. With no less than 22 saloons, gambling, a red light district, and a lot of miners carrying silver, crime was bound to happen. There was a deputy and two constables, as well as two lawyers and a justice of the peace. The owner of the Silver King Mine was the Sheriff of the entire San Bernardino County, but several murders still went unsolved. Main street became so rowdy that families of merchants chose to move their families away from the mining area, where they created their own residential area. An alcoholic who died after completing his life's goal of 100 drinks in one sitting. An unemployed millman who robbed the Runover Mine’s superintendent James Patterson at gunpoint. Dodson made off with the payroll, estimated at $4,365 and stole Patterson’s horse. Unfortunately for Dodson the horse went lame and a posse caught up with him. He was killed in a shootout, but the posse was uninjured. An unemployed mining broker from Los Angeles. While trying to restore order at Dickerson and Mosely’s Saloon after an argument broke out over an all-night card game he was shot to death by Edward P. Scotland, who was later found guilty of manslaughter and sent to San Quentin. While returning to town excited over his latest haul, Rubio made the mistake of bragging about the six dollars in silver and eighty dollars in gold he had found. He bought drinks for his friends at a local saloon, which unfortunately drew the attention of an unknown criminal. After Rubio left the saloon he was followed, shot to death and robbed. Rubio’s murderer was never found. Calico has a wonderful collection of antique vehicles including this 1888 Ahrens Steam Fire Engine.